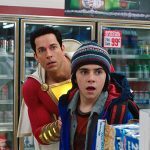 L-R: Zachary Levi and Jack Dylan Grazer in “Shazam!”; Courtesy of Warner Bros. Pictures(NEW YORK) — Shazam! fought off challenges from more than a few newcomers to spend its second week at number one at the box office, earning an estimated $25.1 million. It added another $35 million overseas for a global total $258.8 million. Little topped the new releases, delivering an estimated $15.5 million for a second-place finish. The switcheroo comedy, starring Regina Hall, Marsai Martin and Issa Rae, earned an estimated $1.9 million overseas. Hellboy flamed out in its debut, only managing to take third place with an estimated $12 million — far below the $17-20 million the studio had hoped to make. The reboot of of writer/director Guillermo del Toro’s 2004 big-screen adaptation of the comic book, starring Stranger Things‘ David Harbour, was expected to give Shazam! a run for its money. Pet Sematary dropped to fourth place, earning an estimated $10 million in its second week of release. Disney’s live action remake of Dumbo rounded out the top five, collecting an estimated $9.18 million. Missing Link, the stop-motion animated comedy featuring the voices of Zach Galifanakis, Hugh Jackman and Zoe Saldana, also fell short of expectations, managing just $5.8 million instead of the anticipated $9-12 million, for a ninth-place finish. In contrast, the weekend’s fourth new release, the drama After, beat predictions, placing eighth with an estimated $6 million debut. Opening in limited release, Mary Magdalene, starring Joaquin Phoenix and Rooney Mara, earned an estimated $62,436 from 62 theaters. Elle Fanning’s musical drama Teen Spirit delivered an estimated $44,361 from four locations. Elsewhere, Bohemian Rhapsody passed the $900 million mark at the worldwide box office.